“It is very offensive to my imagination to see the dying stiffening into statues…” Oh, how brilliant is this. Well, as brilliant as the man named Thoreau. Wow. What a great post at the perfect time. Can you believe that this country is fighting over statues and (revisionist) history? Civil War 2.0, a sad echo of what HDT wrote about in Slavery in Massachusetts & about John Brown. I knew about this quote, but didn’t know that it was concerning a statue for Horace Mann. 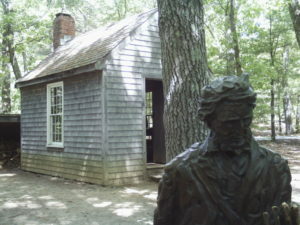 Thoreau’s Journey West would take him on a long trip with Horace Mann Jr. Did the topic ever come up? Awkward conversation, indeed. What a beautiful and thought provoking piece, with a lovely ending. My own feeling is that while Thoreau may have not entirely approved of the statue near the pond, it’s in keeping with his spirit as it’s not on a pedestal, and welcomes touching (not to mention selfies!) Lovely quote from your friend Lisa. I’m a huge fan of Daniel Chester French, but in this age generally prefer the memorials that honor a group of people rather than one. Thank you for sharing your thoughts, Jeannine! Yes! And I think Henry would abhor that statue of himself. :-) I wonder how he felt about grave stones — his is quite simple and the mementos left behind are lovely. Very nice article, much needed!